Michaela Atanassova in Gaming on 3 November, 2016. 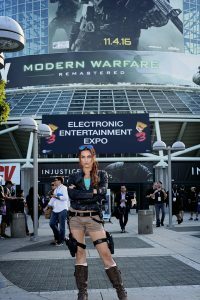 E3 2016 has revealed mostly new upgraded entertainment hardware offered by the eminent game companies like EA, Ubisoft, Bethesda, Micosoft (XBOX One S), Sony (PS4). According to Techradar.com Sony was reluctant to disclose details about Sony 4.5 while Microsoft displayed two consoles Xbox One S & Project Scorpio. Virtual reality headsets have also gone to the next level with three major headsets even though it is a young entertainment area, it still has its foundations laid. Unfortunately, E3 2016 did not offer totally new franchises but mostly sequels, remakes and reboots. The games that did not appear on the show were The last of us 2, Half Life 3 (which is expected every year), Red Dead Redemption 2, Destiny 2 (revealed only the extension Rise of Iron). Some of the big games have already come out in October and mark the height of the autumn season. Mostly multiplayer games were released like Battlefield 1, Titanfall 2, Fifa 17. Extended ones were like Skyrim Special Edition, Rise of the Tomb raider 20th anniversary pack. Some sequels may satisfy fans like Mafia 3, Gears of war 4, Shadow Warrior 2, Civilisation VI, Dark Souls 3: Ashes of Ariandel, Batman: Return to Arkham. November’s bigger releases include Call of Duty: Infinite Warfare, Watch Dogs 2, Dishonored 2, Final fantasy XV which is much more intense than December (unlike 2015). With autumn season being almost over, it is time to look at the upcoming games in 2017. Although 2017 will not be as exciting as 2016 there is still room for hope that we will hear news for the Assassin’s Creed saga, the third installment of Tomb Raider, next realistically based Total War game, Starcraft 3, Warcraft 4, The Elder Scrolls franchise, Mirror’s edge sequel. So far we know have been shown some gameplay footage for the games that have exact release dates and we can only hope for some exciting news for the others that are to be scheduled. It is certain that Bioware will disclose more details about Mass effect Andromeda on its N7 Day which s 7th November, 2016. Other sci-fi games which will compete with Mass effect are Destiny 2, Star Wars: The Old Republic, Star trek: Bridge Crew, Horizon Zero Dawn, Halo wars 2, Prey, Quake Champions. For fans of medieval games 2017 will be a quite intense year with games like Mount Blade II: Bannerlord, Kingdom Come Deliverance, Of Kings and Men, Mordhau, For Honor. Strategy will also be quite exciting with Total War’s Warhammer III 40k: Dawn of War, BattleTech, The Elder Scrolls: Legends, Blitzkrieg 3. When it comes to some new role playing games it is relevant to mention Vampyr which will be a semi-open world and has some elements from Dishonored. Vampirism is like a disease that can be cured but the player has to balance between feeding and healing. Interestingly the fights between vampires will include magic and some special moves. Scalebound, on the other hand, includes dragons and parallel worlds. Your main character not only teams up with a dragon but becomes bonded to him and they have a dragon skill they can use on enemies. Action fans will be happy to see Serious Sam 4 which is a classic first person shooter with plenty of fun weapons and additional skills which unlock special upgrades. Its emblematic over-the-top bosses never fail to disappoint the action seeking players. 2017 is packed with sniper games like Sniper Elite 4 and Sniper Ghost Warrior 3. They will be rivaled by Tom Clancy’s Ghost Recon Wildlands. Their stealthy gameplay will satisfy gamers who also like Dishonored or military games. Ghost Recon is a tough to outcompete as it has a memorable gameplay that encourages you to make decisions and choose your most convenient way of bringing down an enemy military organisation. For those who love Greek mythology Kratos returns and now he will be fighting with the god of the Norse mythology. However, there won’t be any Greek gods as Kratos murdered all of them in the previous games. God of war sequel will be added more depth to the main character and will reveal his father like nature. Of course, it will have the typical action moves of the previous games and some new bosses. When it comes to comics, in 2017 the new Spiderman game will rival Injustice 2. Spiderman will be the first game of a new franchise and it will show a more experienced character. While Injustice will include only DC superheroes and it will be more like Mortal Kombat XL. It will not be a strong year for Marvel as they will mainly focus on the superhero movies and TV series. To sum up, 2017 will be exciting for sci-fi, action and fantasy. Adventure games will be mainly somewhat mixed with roleplaying and it won’t be a pure genre. It strikes me that video games have become more mixed genres which are either single player or multiplayer. I have not come across a game which is purely focused in its field for the last 10 years. However, where is the fun if a game has only one style of gameplay and story? It is hopeful that some games are still produced in a manner which is a mix of first person and third person and that they have already developed very smooth mechanics. The most important feature of a game should not only be the gameplay but also the story that develops in a world with its own culture and history. Then it would add more depth to the characters and it will convey its messages more effectively. My hopes for 2017 are that video game developers will learn from their mistakes and take into consideration the criticisms and desires of experienced fans concerning gaps in character development and gameplay. Usually sequels and reboots may turn out to be a huge success or a controversial disappointment. I would rather stay optimistic for the year to come because having too profound expectations whether it is a new franchise, a sequel, a remake or a reboot leads to greater disappointment. If it is fun to play and intriguing, I would say go for it.